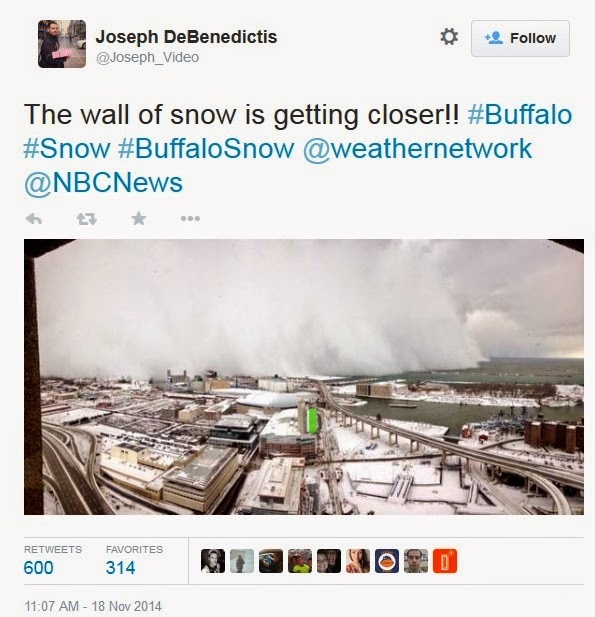 There are times when some places in the United States get worse weather than others...such as Buffalo. The unrelenting lake effect storm that pummeling everything south of Walden Avenue today already has dumped an astonishing 48 inches of snow on Lancaster. Similar totals are being reported in West Seneca, Alden, Depew and parts of South Buffalo and Orchard Park. It may turn out to be a six footer. Any more snow and we may have to send this to western New York. makes the 50 in in upper WI look like nothin. I've always wanted to say that word in polite company, but never found the opportunity. Did I win? Feel free to send any you don't want to water starved California... now there's a business opportunity waiting to happen. Climate Change Moving and Drayage Inc.
Actually, we are getting hit right now with waves of rain. Never enough (just too many people...and too many almond trees and too much rice).